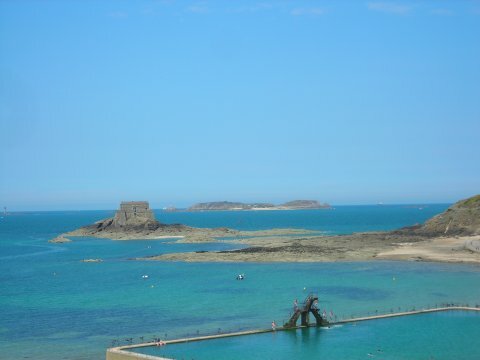 We dropped our lines in St Helier very early on Thursday morning so we would have enough water to get over the sill at the marina entrance and also arrive in St Malo in time to do likewise there. There's something special about being up and about early before anyone else and creeping out quietly, but then Andy used to think that when he had a paper round... It was barely light and as we rounded the breakwater very foggy, so this gave us the opportunity to use the radar and AIS in earnest for the first time, rather than just as an amusing distraction. It is very comforting to see things from tankers to seagulls and pot markers on the 'telly' first, and then watch them emerge from the gloom exactly where you expect them to be - worth every penny. 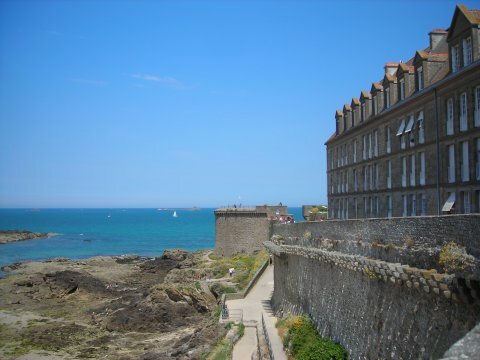 Frustratingly, we had another windless day, so motored all the way to St Malo to cross the sill in time. However the fog cleared after a few hours, so at least we could enjoy the afternoon sunshine. 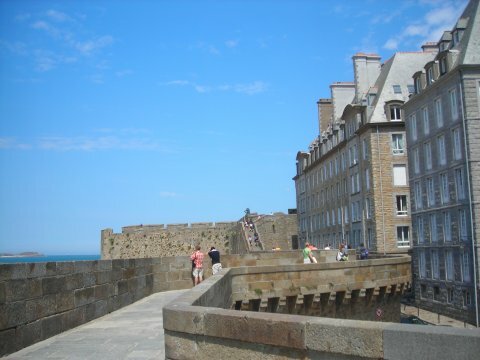 On Friday we walked into Intra Muros, the old walled city of St Malo and had a leisurely stroll right around the ramparts. 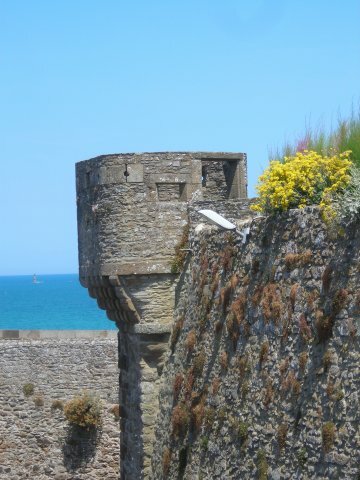 Apparently the walls survived bombing during the Second World War, but most of the buildings within were destroyed. 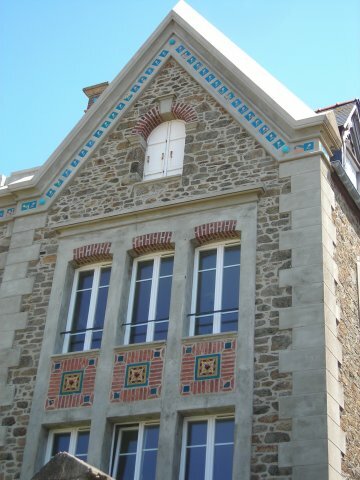 They have, however, been rebuilt magnificently in the original style making the views from the ramparts back into the old town almost as beautiful as those across the Baie de St Malo. On Saturday we walked to the hydro electric barrage on the River Rance, to inspect the lock which enables passage up stream, with a view to going the next day. However, we decided against doing so, as we could travel only about 3 miles upstream, and the lack of fenders deployed in the lock lead us to believe the chance of damage was quite high, and not worth the risk. 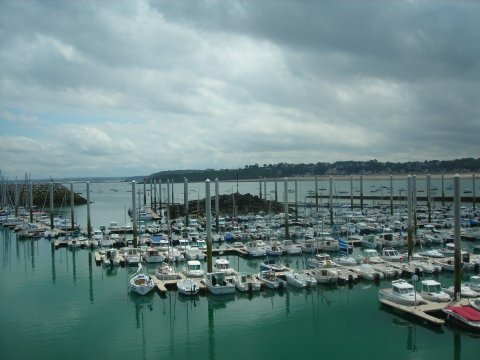 We had planned on staying 4 or 5 nights in St Malo, however the lack of internet access meant Andy couldn't do any work, there was no launderette (the one in town was a 15 minute walk away from the marina), so we set off for the brand new marina at St Cast on Sunday. 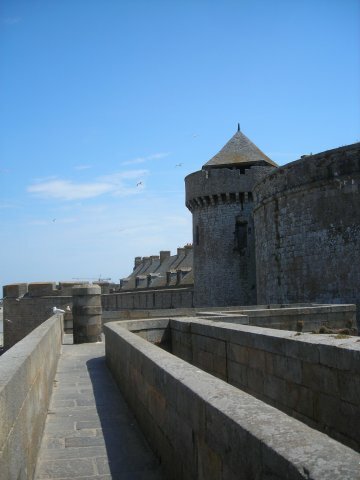 The city wall in St Malo. 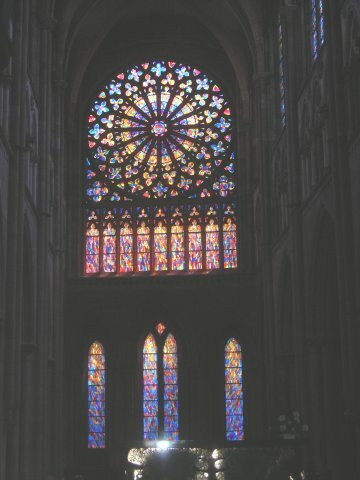 The stunning pastel colours of the stained glass windows in the church in the old town of St Malo. On reflection, I'm not sure why we went to St Cast - we had been told in Cherbourg that it was an excellent new marina, not in the almanacs or pilot guides yet. This is true - it has brand new pontoons that are twice the length that is common in French marinas, and zut alors - they even have cleats! But I had already been told that the 'facilities' are not yet finished, and are currently in a portacabin - not sure why I forgot this Tony! However it was almost worth it just to see how the French overcame the problem of there being a large rock right in the middle of where they wanted to build a marina - the British may have 'destroyed' it, but the French simply built pontoons around it - they even kept the isolated danger mark on top of it! The weather is set to improve on Saturday or Sunday, so we'll set off west then.